GREGORY WILPERT: Welcome to The Real News Network. I’m Gregory Wilpert coming to you from Quito, Ecuador. The European Union has begun a process to activate Article 7 against Poland, the most extreme sanction that the European Union can impose against one of its own member states other than kicking them out entirely. If the article is implemented, it will revoke the right of Poland to vote in the European commission. Officially, the reason for the proposed sanction is Poland’s reform of the Judicial Branch, which restricts the ability of the Polish Supreme Court to intervene in legislation. 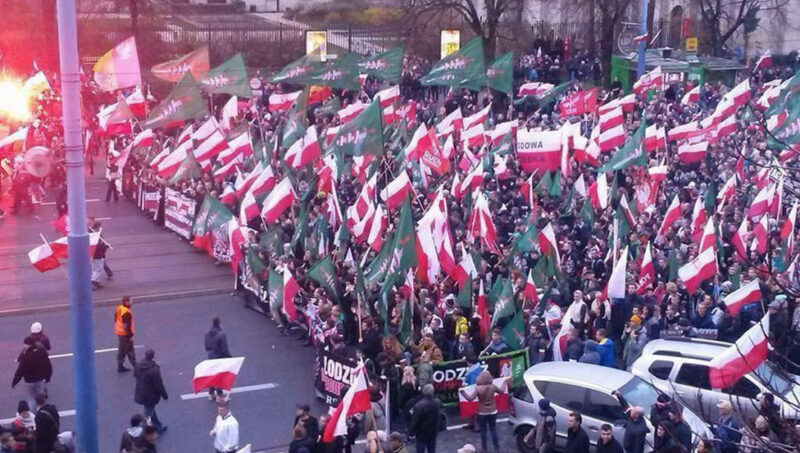 However, behind this reform is the far right world view of the Polish government. Meanwhile, Hungary pledged its support for the Polish government, and the two governments have formed a united front against the rest of the EU, which they condemn as being too liberal. The right wing alliance is based on both country’s adamant position against accepting more refugees. Polish Prime Minister, Mateusz Morawiecki visited Hungary last week and had this to say. MATEUSZ MORAWIECKI: [Translator]: In terms of migration and quotas that were to be imposed on member countries, we strongly reject such an approach as it infringes on sovereign decisions of member states. We are of the opinion that the EU commission does not have the right to implement such solutions. GREGORY WILPERT: Joining me to discuss the situation between the EU, and Poland and Hungary is Carol Schaeffer. Carol is a freelance journalist covering central and eastern Europe and writes about right wing nationalist movements for The Atlantic and other venues. Thanks for joining us today, Carol. CAROL SCHAEFFER: Thank you for having me. GREGORY WILPERT: So first of all, explain to us briefly what the judicial reform in Poland is about and why does the EU consider it to be undemocratic? CAROL SCHAEFFER: So, the judicial reforms and the rejection of an EU-imposed migrant quota are technically separate issues, but both constitute a shift to the right in eastern Europe and a battle over European values. The European Court of Justice has taken issue with the ruling Law and Justice party in Poland’s judicial reforms, namely because it would allow the government vast power over the independent supreme courts, and the courts in general. And it’s been rejected by the EU Commission as undemocratic because it is a centralization of power and eliminates the checks and balances critical to democratic government. And the asylum seeker quotas is a means of the European Union to distribute asylum seekers into participating EU member states. And it sees Poland and Hungary, as well as the Czech Republic, Slovakia, and Romania as well, and they’re lack of participation as undemocratic because these countries wish to continue to receive EU funds without participating in this shared endeavor. GREGORY WILPERT: So, like you say, it seems that the question of the reform and procedure which is at heart of the judicial reform is a secondary issue. And the actual one over which the EU on the one side and Poland, Hungary on the other, diverge has to do with other things which has to do with migration issue. So, what is the actual refugee situation in eastern Europe? And particularly in Poland and Hungary at the moment? CAROL SCHAEFFER: Well, the refugee situation or the migrant situation, however you want to call it, it’s complex. For example, in Poland, Poland is often using Ukrainian migrants as a foil against the idea of accepting refugees from the Middle East, the global south and east. So, since Ukraine began its war in 2014, there has been, for example, an increase in migrants from Ukraine coming into Poland often the Law and Justice party will site numbers like a million Ukrainians are now living in Poland. The actual situation, although that number is technically correct, the number actually comes from the number of visas that were issued to Ukrainian citizens and does not actually reflect the various reasons and lengths of stay that these people stay. However, that’s not to say that there are not large numbers of Ukrainian refugees in Poland, nor that their situation is not dire. For example, nine percent of Ukrainian immigrants in Poland have no secondary or higher education but as many as 70.7% perform physical labor. But the cultural and linguistic similarity, in some senses shared history has long made Poland an attractive destination for Ukrainians. And studies have shown that although there was an increase in Ukrainians coming to Poland since Euromaidan, the influx of refugees since the beginning of the war has been vastly overstated. And this is mostly a foil for the Law and Justice party to reject other migrants on essentially racist bounds. And the same goes for Hungary as well. Hungary likewise has made statements that it does not reject asylum seekers out of hand, just ones from the global south and east. For example, Orbán has said in a speech, I think last year, last February, that it would gladly house refugees from, and this is refugees, from western Europe. GREGORY WILPERT: That’s an interesting idea. The united front of Poland and Hungary is challenging the EU’s consensus voting system as well because each of the two countries can veto any proposal that’s aimed at the other. Is there nothing else that the EU can do? And does this mean that other right wing governments in Europe, such as Austria, can now violate EU agreements unilaterally without consequences because they’re developing this united front? CAROL SCHAEFFER: I think that this question is best posed to an EU constitutional law expert, which I’m not. I’m a writer and I would ask someone like that. But my sense is that the answer is not entirely straightforward. Although it is true that unilateral agreement must be made to inflict certain punitive measures against a member nation, it does seem unlikely that this is the first time such an alliance has been made in EU history. So furthermore, Romania, Slovakia and the Czech Republic have also denounced the quotas. So, the legality surrounding such vetoes may not be so cut and dry. And like you say, other right wing governments may also be able to reject EU rules on these grounds. So, I’m not quite sure on the legality of it but I think it’s more complex than just a straightforward answer. I don’t think it’s so cut and dry. I do think it is most likely that this will produce a stalemate and then further solutions will be proposed. Meanwhile, thousands of asylum seekers will continue to suffer indefinitely. GREGORY WILPERT: And right wing nationalism, though, is usually about national pride and exceptionalism. Is the friendship, would you say, between Prime Minister Morawiecki and Prime Minister Orbán of Hungary just a convenient alliance to break the EU consensus process? Or does it represent a new kind of international front of the extreme right? CAROL SCHAEFFER: I would argue that it’s the latter, that it’s an international nationalism. To my knowledge, again this is not the first attempt at such a coalition. However, I do have, I do believe that it is an international nationalism. I also would like to say though, that I think the limitations of some of these alliances should be kept in mind. For example, Poland and Hungary differ greatly on their attitudes towards Russia and their involvement in NATO. But more presciently, I do think that we will continue to see alliances between far right parties in Europe and perhaps beyond and they will continue to be united by more than what they disagree on, namely frankly a racist platform against the global south and east. GREGORY WILPERT: Actually, could you just say a little bit about that, this platform? I mean, apparently the prime minister, president of Hungary, Orbán, he has said something like that he’s in favor of an illiberal democracy. What else can you say about the actual positions that they’ve taken? CAROL SCHAEFFER: Well, Orbán in particular, has turned to Russia, China as models for exactly this illiberal democracy. I think what that means is, for Orbán’s sake that means establishing a greater authoritarian rule within Hungary. And Poland is beginning to align not with Russia because of its more complicated past and relationship with Russia in the earlier part of the 20th century, but I could see an alliance with Hungary against a liberal European Union, which the rhetoric in Poland has already been about, the rhetoric in Poland has already made references to the European commission, the European Union as just as oppressive as the Soviet Union. And this is a big dog whistle to far right parties. A lot of it is part of an anti-communization platform, which has been going on for the latter part of, well basically since the late ’90s up until now. Yeah. GREGORY WILPERT: Okay, well, we’ll just leave it there for now, but continue to follow the situation. I’m speaking to Carol Schaeffer, who covers central and eastern Europe for The Atlantic, among other publications. Thanks again for having joined us today, Carol. CAROL SCHAEFFER: Thank you so much.